I was recently asked how traveling has enriched our kid’s (and our) education. Well, there are so many ways it’s hard to know where to begin. Maybe we’ll start with the fact that until I was in college I thought that Washington, DC was in the state of Washington. Yes…I went to public school. I somehow managed to graduate without ever reading one book of the required books for English Lit. (sorry Mr. Barrett) And apparently never paid attention in Geography, either. So there are the obvious ways it has enriched our ‘education.’ I now know where the President lives, and it’s not in the Pacific Northwest. One of my favorite things about traveling with our kids in tow is that we get to learn all these new things together. We get to learn about the Ancient civilizations that built their homes in the cliffs and then actually go there and touch, feel, experience their ancient dwellings. How many kids in traditional ‘school’ can say they’ve swam in both the Pacific and the Atlantic Oceans or have stood on the top of Mammoth Mountain, or could even tell you where Mammoth Mountain is? I’m guessing not that many. 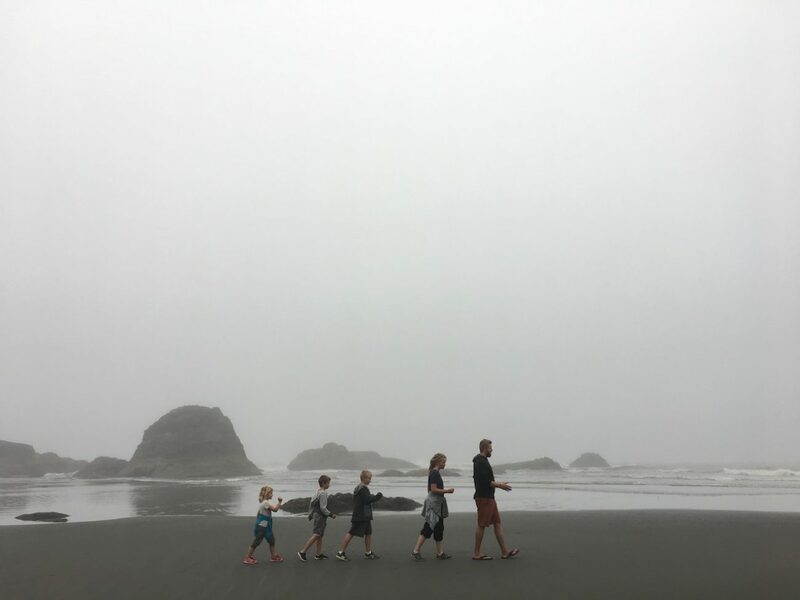 Traveling allows us to give our kids (and us) new opportunities and experiences every week. We are always on the move and even just moving 30 minutes up the road often gives us a whole new area to explore and learn about. A fun fact that we just learned recently is that there is an actual rainforest in the USA. Did you know that? I didn’t! And we didn’t just read about it, we spent weeks living in and exploring that very rainforest. There’s something so special about learning all you can about a place and then actually getting to live there for a bit. To touch the moss on the trees, to hike to the waterfalls, to swim in the streams and walk on the fallen trees that give new life to the plants and animals around it. Learning isn’t just something we do 4 hours a day by staring at books. Learning, for us, is happening every day and in many different situations. This week our oldest wants to learn how to bake bread. But not just bake a loaf, she wants to learn the art of baking bread. She wants to know what makes a great piece of bread and the different techniques for different types of bread and I am so excited that I get to help teach her! She’ll research recipes that she wants to try, find the ingredients, write out a recipe card, watch videos on how to properly knead a loaf and why it needs to rise, and how long it needs to bake, etc. Heck, she’ll even be practicing her fractions because we only have 1/4 cup measuring spoon and I know the recipe calls for 2/3 cup of water. You see, learning for us isn’t only with workbooks and standardized tests. We are constantly learning how to live this crazy life were given. I believe, with all my heart, that the desire to learn is deep within all of us. I’m constantly wanting to learn new skills. In the last few years I learned how to build farmhouse tables, paint custom signs, make amazing salsa verde and the proper way to smoke a hunk of pork shoulder. I’ve taken a stained glass class and learned how to do a few cool macrame projects. Our kids are watching us. They are here with us every day and see our desire to create and learn new things…and that rubs off on them! After watching me make a macrame planter, Adali picked up it up in no time and has been selling her own creations! She took it upon herself to watch tutorial videos and let me know what she needed to make what she wanted. It’s been really cool to watch her turn into this young lady and watch her desire to learn new skills. Last I checked, they don’t have macrame classes in school, and probably not bread baking classes, either. So yeah, it’s crazy to think of all the ways traveling has enriched our lives. It’s given us so much freedom and time to dig deep into our new interests and passions. Having the time and headspace to learn all these new things is great, but the experiences these kids are having in a new place every week is something they will carry with them the rest of their lives. They will grow up and know that they can make it wherever they end up. They will be able to talk to adults and actually carry on a conversation with someone that’s not the same age as them. They’ll feel, smell, and taste things that most kids their age won’t. They’re fully immersed in this big, beautiful world and they have the opportunity to see and experience it all first-hand. That’s education. That’s living. So, for us, education might look different. For now, we’ll camp under the moss covered trees, wake up in a dewy tent with the aroma of last nights campfire embedded in our clothes, bake bread, hike and enjoy this big beautiful world we live in...and we’ll learn as much as we can along our way.